Whoop whoop! Day 8 of 10 days of free planner printables is here! 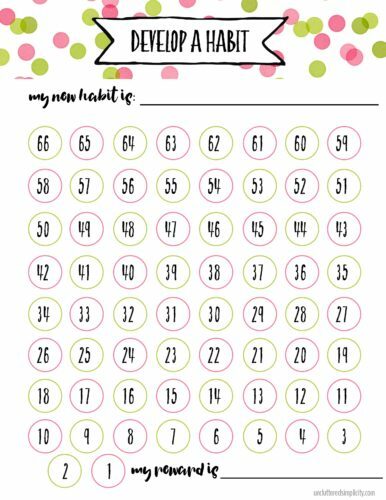 Today, we are going to talk about what it takes to form a new habit and I have included a free printable habit tracker to help you chart your progress. Plus, it’s available in two sizes-full or half to fit most planners. *Be sure to check back for more free planner printables! 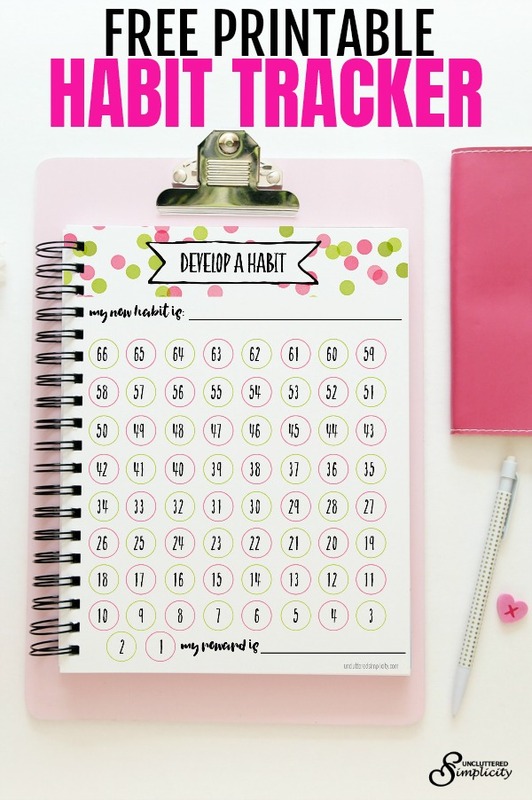 Did you know it can take up to 66 days to form a new habit? That seems like a really long time, I know. It’s important to work towards small, manageable goals when you are trying to form a new habit. For example, rather than swearing off alcohol completely, first, resolve to stop drinking on weekdays. If you’re a heavy drinker, you can vow to have one less drink per day. Once you’ve mastered that, you can move on to cutting it out altogether. Likewise, if your goal is to eat more vegetables, set an achievable goal of eating one extra serving of greens per day. This small, yet attainable goal is preferable to say, trying to go vegan overnight. As with anything worthwhile, when starting a new habit, it pays to be consistent. Staying laser-focused on your goals will help you will achieve them more quickly. It’s best to make a practice of repeating your new habit as often as possible. Therefore, it’s better to determine to do something every day rather than three times a week. That said, if three days a week is all you can handle at first, it’s still better than nothing. Also, you’ll want to try to keep the timing of your new habit as consistent as possible. Eating meals at the same time each day, or workout at the same time each day is a good way to develop a new habit. I guarantee you, you will absolutely face obstacles when you are trying to implement a new habit. It helps, though, if you have a plan in place for when these disruptions occur. For example, if your goal is to stop going through the drive-thru on your way home from work, set yourself up for success ahead of time by making sure your pantry and refrigerator are filled with healthy food that is also quick to prepare. If you do happen to slip up and grab that cheeseburger, forgive yourself and move on. Don’t allow one or two setbacks to cause you to give up on your long-term goals. 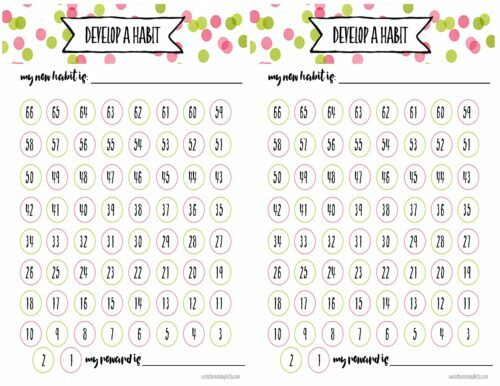 You’ll notice my free printable habit tracker has a space to fill in for a reward. Use it! Starting a new habit should never be unpleasant. You can keep it light and fun by creating small, enjoyable rewards for yourself. There’s no need to wait until you’ve reached the 66-day mark, either. You can treat yourself to a night out after a week of cooking at home, or a new pair of running shoes after two weeks of going to the gym. Rewards don’t have to be extravagant or expensive, but it is important to make sure they align with your goals. For example, you don’t want to reward yourself with a dozen doughnuts if your goal is to lose weight!